One of the most successful long-running television series ever in Australia, 'Blue Heelers' enjoyed a 13 season run between 1993 and 2006. The all-star cast includes John Wood, Lisa McCune, Martin Sacks, Julie Nihill and William McInnes, with some high profile guest spots featuring the likes of Hugh Jackman, David Wenham, Gary Sweet, among others. The award-winning series (including 25 Logies) remains one of the highest rating Australian series ever. 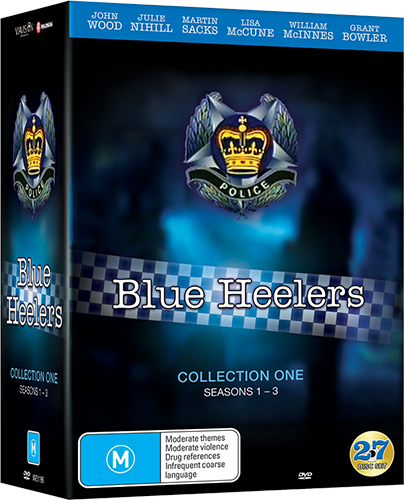 'Blue Heelers' Collection 1 (Seasons 1-3) features 126 episodes including the pilot, extras and of course the beloved characters of Tom, Maggie and PJ. This collection will be closely followed by 'Blue Heelers' Collection 2 (Seasons 4 – 7) in September 2017, Collection 3 (Seasons 8 – 10) in October 2017 and Collection 4 (Seasons 11 – 13) in November 2017. The 'Blue Heelers Seasons 1-3' competition has now closed. Winners will be announced shortly. Competition opens at 5pm AEST on Sunday 2nd July 2017 and closes at 11:59pm AEST on Sunday 9th July 2017. Five winners will be chosen at random on Monday 10th July 2017. To successfully win, entrants must fulfil the above entry conditions before the time the competition closes. Current members/followers are eligible to enter the competition. Only one entry per person. Only one winner per household. To be a valid winner, the entrant must not have won a prize from SWITCH within the last 28 days. Each winner will receive one DVD copy of 'Blue Heelers Seasons 1-3'. By entering, you agree to receive occasional emails from SWITCH in the future. If you decide to unsubscribe from these updates, any further entries will not be applicable. Only Australian residents are eligible to enter. 'Blue Heelers Seasons 1-3' is available on DVD on Wednesday the 5th July 2017 from Via Vision Entertainment.